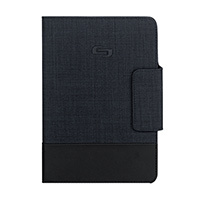 Solo Velocity Universal Tablet Case with tension clips securely holds virtually all 8.5 to 11 inch tablets. Adjusts to multiple viewing angles. Magnetic strap ensures the case stays closed.